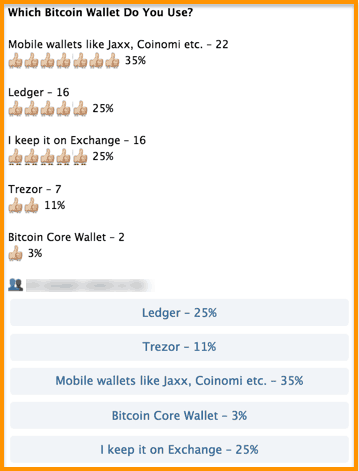 We did a poll in our CoinSutra’s Telegram community on Bitcoin wallets recently and asked our audience about the Bitcoin wallets they use. We were quite shocked to see the results because we found out that 25% of users still keep their BTC on exchanges. Shocked because keeping your BTC on exchanges is not a safe practice at all and we have stressed on it a number of times on our blog too. What really made us happy was that the fact that more than 35% of users use hardware wallets to keep their BTC safe, which is a very good practice. Out of this list of Bitcoin wallet options, we are also huge fans of hardware wallets like Trezor and Ledger Nano S.
However, we love Ledger a little more because they are fast at implementing and supporting new cryptocurrencies but that certainly doesn’t mean Trezor is less useful. 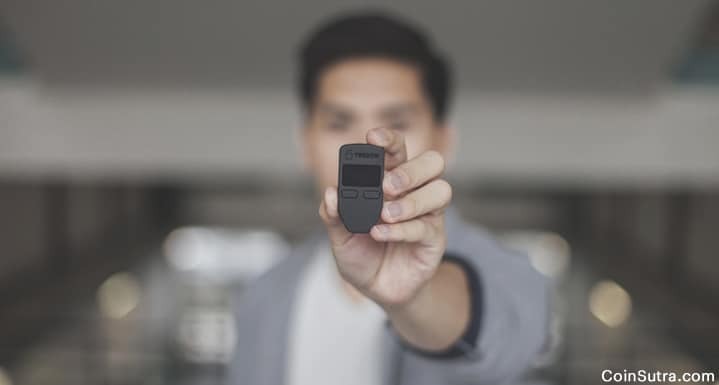 Trezor, if you don’t know, was the first Bitcoin hardware wallet in the market and they were also the first one to implement a passphrase feature on their devices. The passphrase feature secures your funds even if your device gets stolen. That is because they can’t break into your wallet, courtesy the passphrase. Here is a video that we made for you on Trezor’s passphrase feature. Also, hardware wallets like Trezor help you get rid of the headache of handling your private keys directly because with a hardware wallet you get your 12-word seeds keys which are pretty simple to handle. As well as forks like Bitcoin Cash, Bitcoin Gold and Ethereum Classic, they were fairly fast in providing support for these fork coins. There are certainly other benefits to using Trezor. Their third-party integrations are also broad, the details of which I have emphasized in this article. So, in short, using a hardware wallet like Trezor to keep your Bitcoin and other cryptos is the safest bet you should definitely play once because they are any day better than a desktop or mobile wallet. I know this will make you curious to know more about cryptocurrencies that Trezor supports, so without any further delay, here is the list. What Coin Does Trezor Support? Here is the list of Trezor-supported cryptocurrencies along with my insights on these coins. 1. Bitcoin (BTC)- This is a must-have coin in your portfolio. I would say you should have BTC as 40-50 % of your portfolio because being the pioneer cryptocurrency, it is the most dominant one. 2. Bitcoin Cash (BCH)- A fork of Bitcoin as you know but for a different use case. I would advise you to just HODL of it if you got BCH at the time of fork because it is certainly going to survive and will have good value in future. But don’t fall prey to its PR games where it tries to claim that BCH is the actual BTC. 3. Litecoin (LTC)- This is a must-have coin in your portfolio for 5-10 % because being a copy of Bitcoin with improved block timing, a different proof of work and different supply Litecoin has always served as a testbed for Bitcoin’s future implementations. So it is also here for the long term. 4. Ethereum (ETH)- You can have Ethereum in your portfolio up to 20% because it is aspiring to be the world’s only super giant computer. But keep in mind that it has an ever-increasing inflating supply, but still a good investment right now. 5. Ethereum Classic (ETC)-This is a forked version of ETH and you can read more about it here. 6. DASH (DASH)- DASH is definitely a good investment with improved governance mechanism and better proof of work backed by a dedicated team so it should be 10-15 % of your portfolio. 7. Zcash (ZEC)-Zcash is total anonymous coin which has implemented Zerocash protocol for the first time but I would not recommend this more than 5% for your portfolio and you can read more about it here. 8. Namecoin (NMC)- Not recommended for your portfolio but you can read more about it here. 9. Dogecoin (DOGE)-Not recommended for your portfolio you can read our detailed guide on it here. 10. ERC-20 Tokens- ERC tokens are slowly gaining momentum some of the ERC tokens that are worth looking are OmiseGo, Golem, and CIVIC. But not all of the coins have a natively supported app for them. Still, they can be used with other interfaces. 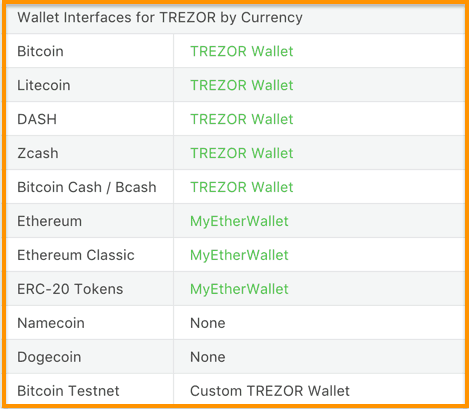 Here is the list of Trezor supported coins as per their interfaces. Another benefit of using Trezor is that it lets you connect with other third-party apps from which also you can manage your crypto coins. Don’t worry, these third-party apps act only like the interface and your private keys never leave your hardware devices. If in an unforeseen event you lose or damage your Trezor device, you can recover your BTC funds by using your Trezor’s seed and a seed compatible wallet. If you are a long time HODLer of these coins, I strongly recommend you use Trezor and keep your funds safe there. If you are starting now, you should buy these cryptocurrencies from our exclusive list of best cryptocurrency exchanges that we have curated for you and then use Trezor to store them. Visit the official Trezor site here. I will keep updating this list as Trezor keeps increasing its support for new cryptocurrencies. Thank you for the review. It was helpful. What is the difference in an ERC-20 token and how do I go about adding ERC-20 Tokens- ERC tokens like OmiseGo to my Trezor? 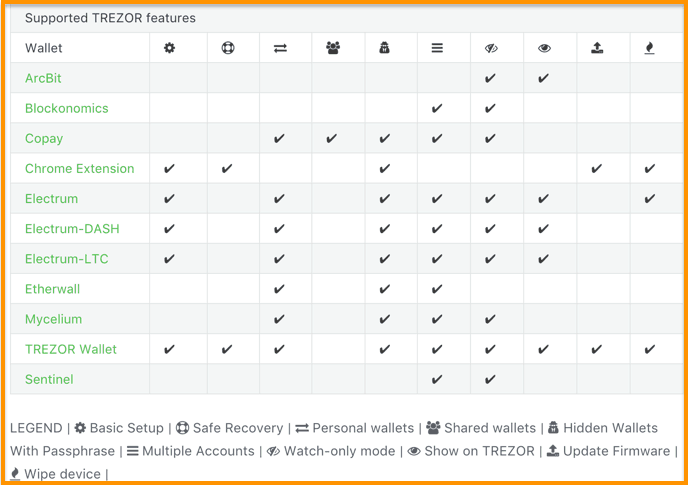 2) Trezor is like a pendrive in which There will be different folders where I can store 6-7 different Coins in different folders. 1) No, it is having no limit. You can store any number of coins there is no restriction in terms of GB. Also, understand how wallets works. Does Trezor yet support cold wallet storage for XRP, XLM, ADA? I saw that it was going to, but did not know how old that info was on their homepage. Would be interested in Ledgar as well. I use a Chromebook OS Android.